I've been tinkering with the design for a bit. You'll notice you no longer have to hug your screen to read anything. Not that there's anything wrong with hugging your screen, It's now optional. The main reasons for redesigning were Maarten and Maarten. 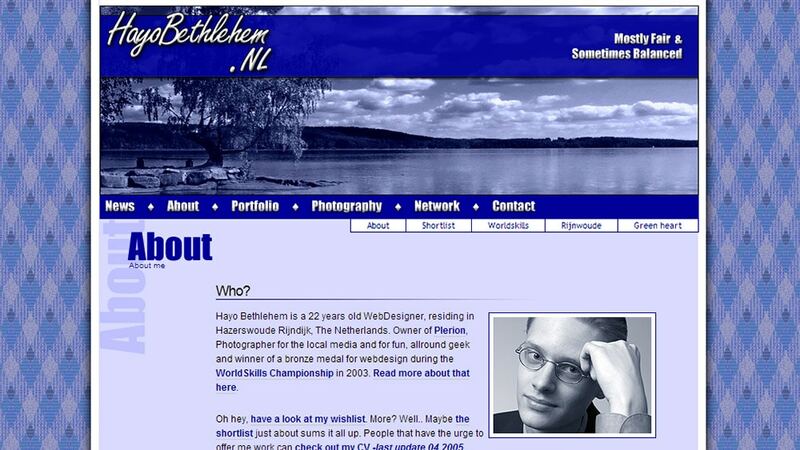 It was quite confronting to see my website displayed on their huge resolutions, Maarten‘s 17″ widescreen laptop screen finally pulled me over the edge. Designing for 800×600 is one thing, but adhearing to this too strictly can cause problems in the higher resolution section. As large screens are becoming more common, I had to rework my site with some out-of-the-box thinking (ha-ha-ha). Before anyone starts whining; yes, it is a redesign, and no, I did not just throw together another stylesheet. One of the main things I tackled was the Photography section. Photographs now have their very own URI scheme and no longer have to be opened in an evil popup window. The redesign was put together in under three days in total. One day for the Photoshop mock-up, one day for “implementation” and one day for cursing the bones out of Internet Explorer 6, Opera 7.54, and Opera 8beta respectively. Something else is horribly wrong.